below. Note the different 'truncated' ends on the last two. 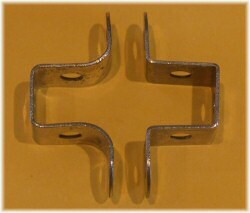 The very first nickel-plated double bent strips had curved corners, particularly at the bottom, as you can see on the left-hand example in this picture. After 1916, the corners were made much sharper as in the right-hand example, and all subsequent parts were made like this. This part was (fairly obviously) made from the 2½'' strip part number 5. You can see how this is the case, as the versions after 1973 change from radiused ends to truncated ends along with part number 5. Subsequent variations in matt brass and iridescent also have these ends, which can be seen in the main photograph at the top of this page. But life is never this easy – Ed Barclay has helpfully (!) supplied examples of both army/combat multikit and matt brass parts with radiused ends. Certainly it is beyond belief that the matt brass ones were made from pre-1973 blanks. I can't think of any reasonable explanation for these, can anyone else? Clive Weston has also come up with an MME-style double bent strip. With a start date of 1907, it is certainly possible that this part was introduced before the change to solid steel strips, but this would have to be a very rare part indeed, only produced for a few months at the most. The example shown in the table below looks good, and doesn't immediately appear to be a mutilated version of a part 2. The picture shows an early post-war pack of double bent strips, in medium green, wrapped in brown paper. Later these were packed in the usual yellow boxes, as the example to the right with the light green label, identifying light green parts from 1958 onwards. Note: ¹ It is not known with any certainty when the olive green and blackened steel varieties were used in Combat multikits, nor why there was a change. Further research needed, do you have an unopened Combat multikit that you can date you could tell us about? It seems certain that olive green is much more common than black. Calais-produced 45s are noticeably narrower than those from Binns Road. A sample of several from each source showed Calais types to be about a millimetere less than Liverpool and made from thicker material which means the room available inside the 'U' is considerably less. This was revealed when used to form a bearing for a Coupling; the rotation angle wasn't great enough in the Calais types.